In today’s world of electronic music, there are few rules. Artists are freer than ever to write, record, and color outside the lines. For Cash Cash, the New York City based group known for their infectious dance music, this is the creative, anything-goes climate they’ve been waiting for. Cash Cash is an electronic music trio originally hailing from the Garden State and currently signed to Big Beat/Atlantic Records. The group consists of brothers Jean Paul Makhlouf and Alex Makhlouf, as well as life-long friend Samuel Frisch. Together, the three DJ/Producer/Multi-instrumentalists record, mix and master all of their music. Having released four full-length albums and an array of EPs and singles, the trio continues to blur the lines between genres. In the midst of creating their extensive catalog of charting originals, they have also found success producing and co-writing Krewella’s “Live for the Night,” along with producing official remixes for major artists such as Katy Perry, Bruno Mars, Britney Spears, Kelly Clarkson, David Guetta, Hardwell and many others. Their latest full length album “Blood, Sweat & 3 Years,” is Cash Cash’s way of bringing music listeners from all genres together under one rattling roof. JP Makhlouf stated, “Our goal was to merge different styles from hip hop, rock, and pop with electronic dance music.” An ambitious and intense project that took 36 months to complete, the LP blends tear-jerking lyrics, expressive synths, thunderous basslines, and the group’s signature infectious melodies. It also showcases their knack for pushing familiar voices into new territories with a star-studded lineup of A-list guests including John Rzeznik of the Goo Goo Dolls, Nelly, Christina Perri, Bebe Rexha, Busta Rhymes, B.o.B, Trinidad James, and many more. “We hate buying an album if it all sounds like one song,” JP says. “The same synths, the same drums, the same moods. We get excited when we hear something untraditional. Musically, that’s what we are after.” To get there, they insisted on taking the long road. It would’ve been easy to trade tracks over email between tour stops, but they felt proper studio sessions would inspire a deeper level of collaboration with the featured artists. JP says this approach was “a lesson in patience, thus the album’s title,” but the only way to land on something truly new. “A lot of DJs never even meet their features, they just trade stems and acapellas over e-mail until someone decides it’s ready,” JP says. also broke US Top 40 radio and reached #1 on US dance radio. The group’s success extended beyond their home turf after achieving platinum, gold, and silver records in countries such as Canada, the United Kingdom, and Australia. “Millionaire,” their dancehall-infused summer anthem with Nelly, gained over 50 million streams and views. JP says the pinch-me moment came when the rap legend decided to add his signature “must-be-the-money” vocal stamp into the song. The nostalgic throwback was unexpected, but fit perfectly with the rest of the album which makes distinct and sometimes familiar voices feel fresh and new. The trio grew up together in northern New Jersey playing various instruments in bands and recording in their basement studio. As they evolved from an electronic band to a production group in 2011, they quickly established themselves as musical risk-takers whose imaginative song structures and energetic live shows caught the attention of heavy hitters in the music industry. By 2012, they had released music through Universal Music Group, EMI, and iconic Dutch dance label Spinnin’ Records. 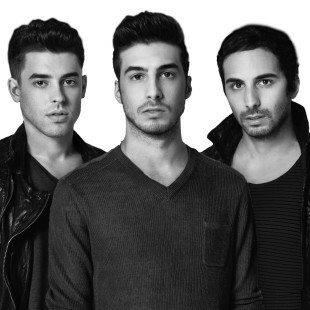 Cash Cash took on a nonstop touring schedule since 2008, leading the group to sell out various headline tours around the world including their “Untouchable” and “Must Be The Money” tours in 2015 & 2016. Their touring history also includes a laundry list of main stage festival sets and their own headline residencies in Las Vegas and Atlantic City. For Cash Cash, the collaborating doesn’t stop in the studio, as they continue to bring their features and outside artists to their shows. Their guests have included artists such as Wiz Khalifa, Busta Rhymes, French Montana, Rae Sremmurd, ILoveMakonnen, Bebe Rexha, Lil Dicky & E40. Their new 2017 residency with Hakkasan Group has the trio in Las Vegas frequently across venues Hakkasan, Jewel, Wet Republic and Omnia; starting the next chapter of Cash Cash.